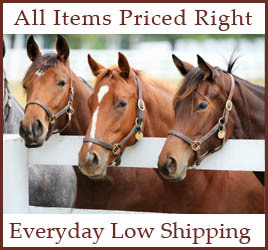 Shop online for your English tack, equipment and supplies. Weathervane Tack Shop is a full service English Tack Shop that is renowned for providing equestrian enthusiasts of every level with outstanding quality, superior service, and the latest equipment and apparel for the horse and rider. At Weathervane Tack, we strive to offer the best English riding apparel, tack and equine supplies at the most reasonable prices around. Whether you are a novice or a life-long equestrienne, you will recognize and appreciate the quality and value of our equine products and services. Our knowledgeable and experienced staff is familiar with specific breeds, riding appointments, rules and regulations. They will take the necessary time to answer your questions and assist you in making the right equipment choices so that you will achieve the highest level of comfort, performance and safety. At Weathervane Tack, you can be sure you're getting the best value for your money. We carry a large selection of products from many manufacturers to accommodate your style and budget. You'll find a full line of quality riding apparel and equipment, English saddlery, tack, horse clothing, grooming equipment and supplies, equine health products, supplements, and medications, stable supplies, fly control products, gifts, books and much more. Our new website will provide you with a fast, easy and secure way to take advantage of our hottest deals and best selling items. If you don't see what you are looking for, please give us a call as we may have it in stock. If we don't, we will be happy to place a special order for you. Weathervane Tack serves Rhode Island, Connecticut, Massachusetts as well as customers throughout the U.S. We carry all major brands for all your equine sporting or show needs. Whether it be for dressage, hunter jumper or eventing, our staff can serve as a valuable resource for horse owners looking for answers to common questions, or trying to find a great deal while they shop at our online store.